What do you get when you combine Mega city one judges and Bloodbowl? You get team Meg-1! 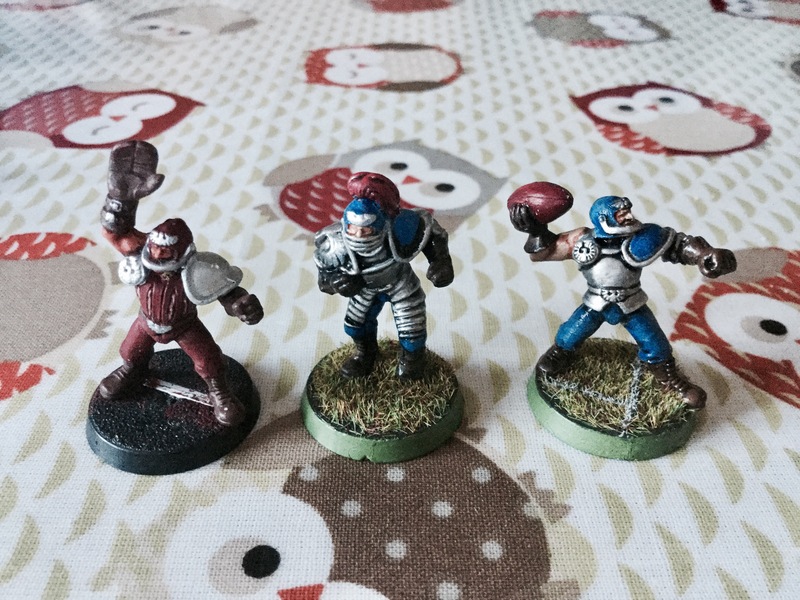 Long time readers may remember way back when I showed a few posts on my classic Bloodbowl team models, I think I called them something badgers? Anyways, that project went nowhere, as I didn’t like the colours scheme direction. So I re-based these guys as a whole and painted them inspired by the colours of the city judges from Judge Dredd (created by John Wagner and Carlos E.). Originally I was going to paint them as Night Lords inspired team, but gradually I decided to go for the judge look. As a fan of Judge Dredd and 2,000ad comics, this was a perfect opportunity to show my skills at painting something inspired by my hobby interests. Whilst the inspiration isn’t necessarily a nice subject (considering judges aren’t exactly morally the good guys), I still thought it would be something new to try out. I do like how the team looks nearly similar to the judges of Mega city one, the right eagle shoulder plate and gear colours tie in quite nicely. But alas, since I wasn’t able to get the full team from the charity shop years ago, I’ve basically got a team that’s missing a second runner. However, I think they’ll do just fine as a display piece for my collection. That’s finally one delayed backlog done, now a thousand more to go! As the title will suggest, I have an important announcement relating to my blog site. So without further or do, I’ll reveal the announcement! However, I want to improve my blog posts even more for you to enjoy, so I’ve decided to announce that I’m going to make an open hobbyist week on the future of my blog site! How will this work and what do I do? The aim for this open week is to share your ideas on where I should to take this blog site on for future projects to schedule. With the help of your choice, constructive criticism and advice, I can create better content thanks to your input in the open week. Do I have to be a follower to contribute my input as well as like the post. Also, do I have to be a experienced in the hobby to vote? No, you don’t have to be a follower of my blog and press the ‘like’ option in order to contribute, nor do you have to be an experienced hobbyist. I want to make this open to anyone who would like to share their ideas, or just to share some advice and constructive criticism. None, if it’s relatable to the subject, I’m fine with anything. However, If I see comments that are unrelated to the subject or are out of line, they’ll be blocked. Simple, share your thoughts in the comment section, with your choice that starts with the subject in capital letters (for example: TERRAIN DESIGN:). When can I start my input? You can share your advice right now, this open week will continue until Sunday the 6th of August. In order to share your advice, ideas and criticism, choose one of the following subject points below that your idea is related to, in capital letters. Once you’ve chosen your subject with advice, ideas or criticism, send it and I’ll reply to your comment as soon as I can. If I have time, we could possibly have a discussion to share hobby ideas, tips and skills. Thank you for reading this post. I’m really looking forward to seeing your suggestions, your input will really help improve my blog. I’m grateful for the hobby community who blog amazing content every week, it’s thanks to you ladies and gentlemen, that I’m inspired to post my collections every weekend. For that I’m happy to support you guys for your hard work. I’m back, after weeks of having a break from the table top hobby, I’ve decided to return to start a new project. Now before I go on, I know I’ve said that I’m starting a Ghoul army, and that is still in the works, so it’s not being abandoned. They’ll be a new post tomorrow on some models I’ve painted for the army. Anyway, back to the subject. 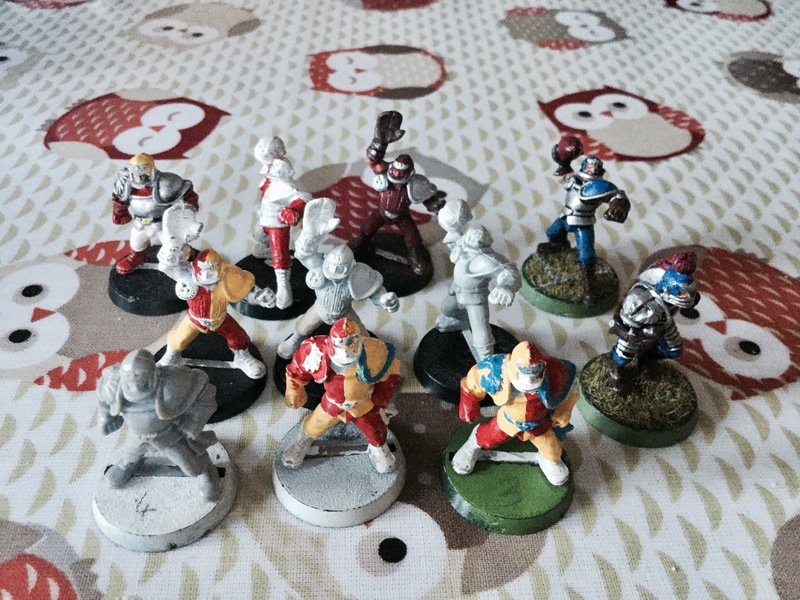 So this week is the return of Blood Bowl, which is great news as I’ve found a few old human Blood Bowl models to re-paint. Just by chance, I found a whole bunch of old models at a charity shop last year, including models from the original Blood Bowl box set! In total I’ve found at least eleven models for the human team (sold as separate models), which if I remembered came around at £3-£4 in total. Sadly, I think there were a few more models needed for the team, but the whole model box was gone a week later :(. But on the bright side, at least I’ve got a near enough full team collection to play. I can add one ogre to the team, which will be fun to heavily kit bash an ogre into a Blood Bowl player. I’ll probably call him ‘Big Steve-fist’, for obvious reasons for his role on the field. I’m just hoping they can be used at my local GW to use for the new Blood Bowl games. If not however, then at least I can display them as a classic diorama showcase. Plan B would be to get a fresh new team of Skaven to use for the new game, naming them as Team Skelnix. So far I’ve test painted three models (pic above) which aren’t bad, but I feel that the colour scheme looks bland in appearance. Same as with the rest of the team, they seriously need some help with a better uniform colour scheme. Thankfully I’ve got a copy of the Stormcast Eternals painting guide, which has quite a few decent colour guides that’ll suit well with these models. I’m currently thinking of trying out the Astral Templars colour scheme, as the dark purple will contrast really well with bright silver shoulder plate armour. In a couple of weeks time I’ll do an update post on the progress for my Blood Bowl team. I may even add a small back story to finish off the project, that’s if anyone is interested. If you guys have any suggestions, post a comment below, and I’ll be glad to read your suggestions :). Now all that’s left is just an awesome team name to go along with team, what about the Red weasels?